Ideally placed apartment in Venice: feel at home! 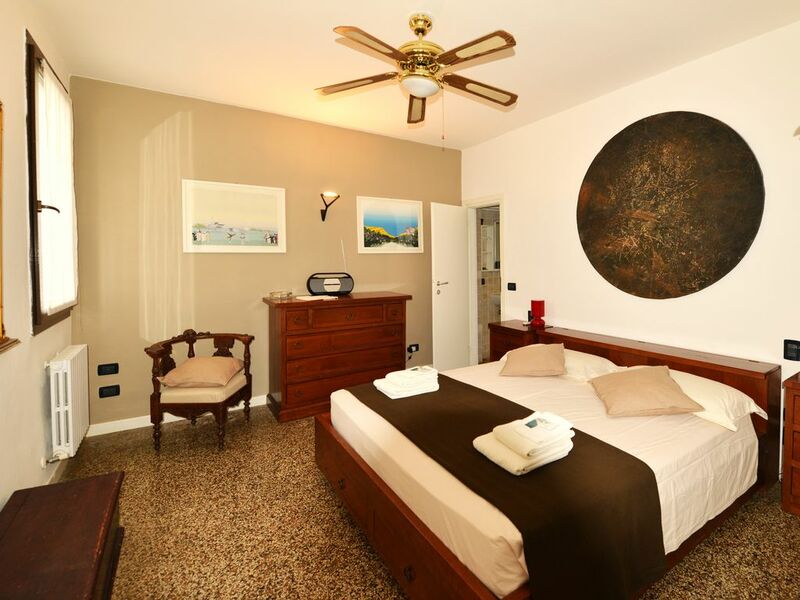 Our property is a lovely new restored flat composed of a small hall, a well equipped kitchen, a double bedroom, a single room with a convertible bed-settee (2 beds normal size 80X190 cm) and a luminous bathroom with shower. Everything is ready for you: the bedroom linen, the towels and the blankets. The guests will find a food-welcome on their arrival for a better spending of the first hours in the apartment! I grew up and I live in Treviso (30 km from Venice). My father is from Venice and he mooved to Treviso with my mother 40 years ago. Now we all live in Treviso, my wife is from Paris and we have 2 children (2 and 4 years old). What do we like more? Travelling!!! This is the apartment where my father was born 73 years ago and where he grew up. Than they mooved to another bigger apartment in Venice having the possibility to keep this smaller one. We are also travellers and we feel like we know what travellers are looking for: we are always happy to get their satisfaction once they come in the apartment on the arrival...it's a pleasure for us! This flat has a great location on a off the tourist wide passage way.The flat has plenty of room and a well equipped kitchen and a comfortable bed.We were met and shown around be Gianni who found us as we were arriving from the train station.We had some difficulty with the map but that is topical for Venice.The flat is just around the corner from the St.Toma vaporetto stop.There are lots a restaurants and a couple of grocery stores near by.Our only caution about the flat is the stairs which are not long but rather steep and only partially supported by a railing.This would only a issue for 80 year olds like me! Of course we really hope to welcome you again in the future!!! If arriving by train, stop at the vaporetti station, buy your tickets and take the #2 boat (or #1) to San Toma' and enjoy the short walk to the apartment. It is a beautiful city and this apartment was a great place to stay to enjoy it. Anne and her family are very nice people and the apartment is clean, well maintained and has everything you need to feel like a Venetian. Walk down the streets, without looking at your phone, and enjoy the architecture, the majestry, the history and the people. Thank you Brandon for your excellent review! It's also useful for next guests! We hope to welcome you again in the future! We were greeted at the railway station with great friendliness and an infectious enthusiasm for this beautiful city. We were helped with our luggage on the walk to the flat, which was not arduous(we are not very fit and in our 60s). we were given a good deal of information and advice as we walked, which was very helpful. we loved the fact that the owner grew up in that flat. It is very well situated for reaching many places we wanted to see, plus has lots of nice "off the beaten track" places we soon learned how to find.We had everything we needed provided. The only thing I would mention is that the flat is too small to accommodate a washing machine, so bring enough changes of clothes for that not to matter. It did not trouble us. We would highly recommend this flat and would love to visit again. Thank you very much for your very good review! We hope to welcome you again in the future! Our experience started with Anna meeting us at the train and actually walking us to the apartment. Even with a map, it would have been difficult without her help. Anna is very quick to respond to emails or texts. The location is great; a short walking distance to the Great Canal, but away from all of the hustle and bustle. She had great ideas for where to eat; in fact, the best pastries are just 100 meters from the front door! We also had one of the best meals of our whole trip just blocks from the apartment. The apartment is as advertised, a plus for sure. After 5pm, the neighborhood becomes very quiet and turns into a lovely place to walk and explore. What a great review you wrote! Thank you so much for this very kind message; we are both happy for your satisfaction and this helps us doing it better in the future! We wish you all the best and we hope to welcome you again in the future! This was an amazing location. It was very easy to reach. You can walk to the apartment from the train/bus station (10-15 minute walk). Or the vaporetta is just a few minutes away. The neighborhood has the feel of being an actual neighborhood of locals. There are several restaurants within steps of the apartment. The Frari church and Ca' Rezzonico museum are very close within 5 minutes walk. The apartment was very lovely. It was very clean and plenty of room for 2 or 3 people. It had everything we need for our stay. The owner met us at the bus station and escorted us personally to the apartment, to show us the way and explain how everything worked in the apartment. We had constant commication with him before the stay. He answered any questions I had promptly. I had a wonderful stay at this apartment and hope to stay again the next time I go to Venice. WOW! What a good review you gave us! Thank you very much for your kindness before and during your stay. It was a pleasure for us and this kind of message helps us doing it better in the future! See you next time in Venice! Our stay at both the location and flat were perfect for accessibility to train / bus / water taxi and all things necessary for a wonderful vacation in Venice. We were met by the owner on arrival, shown the ropes and all things necessary to make our stay a great one. The flat was outfitted to meet all our needs and we appreciated the little basics / sharing items available so we did not have to buy them. Well suitable and recommended. What a great review you wrote dear Jane! Thank you very much and than you because you took care of the apartment in best way. We hope to welcome you again in the future! Have a nice time! good standard of comfort and service.